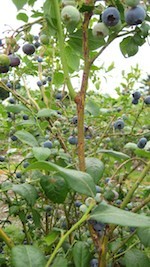 Blueberries growing in the Beacon Food Forest. Photo Credit. Beacon Food Forest. Young fruit and nut trees, P-patch beds, and woodchip paths are just the latest milestones of a three-year volunteer effort to create a food forest in the city of Seattle’s Beacon Hill neighborhood. This food forest represents “exactly the opposite of the tragedy of the commons,” said Glenn Herlihy, manager of field work, marketing, and communication for the Beacon Food Forest. Through its work, Beacon Food Forest is “regenerating public land” and bringing together a diverse community through the common ground of plants. The Beacon Food Forest started as a final project that Herlihy and his classmates created in 2009 for a permaculture design class. The class “decided to take it [our project] to the community [in Beacon Hill]” to see if there was support for its creation and there was, said Herlihy. At the same time, plans were underway to revitalize Jefferson Park, also in the Beacon Hill neighborhood. 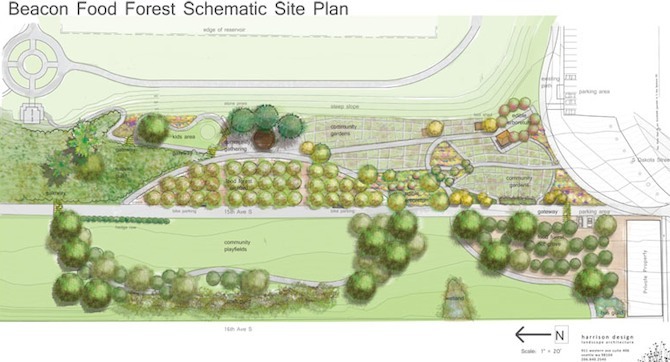 Seeing the community support for the food forest, the park’s master design designated an area as an arboretum. Yet in the end, there wasn’t the money and leadership necessary to create the arboretum so the land reverted to Seattle Public Utilities (SPU) and became grass-covered slopes. In spite of this setback, the food forest supporters sought other ways to create their vision. Though SPU was willing to allow use of their land for the food forest, Herlihy and his team had to prove they had community support and could develop the infrastructure necessary to build and maintain the food forest. To achieve this, Beacon Food Forest joined forces with the P-Patch Community Gardening Program within the Seattle Department of Neighborhoods. This program allocated $20,000 to Beacon Food Forest in 2010 that enabled the organization to hire a design consultant and create a master design for the food forest. Once the final plan was approved, Beacon Food Forest received a grant of $100,000 in December 2011 and phase 1 of the project began. Phase 1 consisted of transforming nearly two acres of grass-covered slopes into an area now filled with 28 fruit and nut trees as well as 30 P-patch plots. It is designed to be a micro version of the eventual seven-acre food forest that will also contain a children’s garden and bicycle trail, Herlihy explained. Though it will be at least five years until the first harvest, he said there was a recent milestone with the first fruit tree blossom. Volunteers are the backbone in creating the Beacon Food Forest. Monthly work parties are held and all ages are invited to attend. On average Beacon Food Forest has 80-100 volunteers, but during mid-February, a small work party is 45-50 volunteers, Herlihy said. Though there is the dirty work of building the food forest, there is also the administrative work that requires volunteers. “You need to count on all multi-generations of people to run a project like this,” Herlihy said, because running an organization takes time: there is a Steering, Site Development, Outreach, and a newly formed Education Committee to staff, along with volunteers needed to assist at public forums and meetings. The organization is pursuing other avenues of raising funds for phase 2 of the food forest, and though they will not receive further grants from the city of Seattle, Herlihy is “proud of what our city has done to help us” because, he says, one does not often see such collaborations of city organizations and community efforts. With the Beacon Food Forest being located on SPU land, there are restrictions not found elsewhere in community gardens. The site is “water quality land,” Herlihy explained, so Beacon Food Forest must use organic practices; no treated wood can be used, and the organization has to be careful with its use of manures. Yet he likes the challenge of creating the food forest under such conditions. “We will show that it is possible to be good stewards with those restrictions,” says Herlihy of the public land that benefits the entire community.